All kids love a good puzzle book. When I was a kid I loved Where’s Wally, I-Spy and those pick-a-path maze books. There have never been any great New Zealand themed puzzle books, until now. 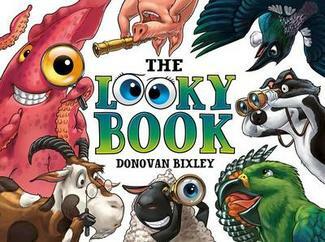 New Zealand author and illustrator, Donovan Bixley, has just published his awesome puzzle book, The Looky Book. Donovan is my favourite New Zealand illustrator and his illustrations for The Looky Book are wonderful. The Looky Book is a puzzle book with 11 different puzzles, all with colourful New Zealand landscapes, birds and animals. There are heaps of things to find in each picture, like find the numbers with the crazy All Black lambs, spot the difference with the mischievous keas, find the animals hidden deep in the bush, and match the farmers to their animals. My favourite pictures are the ones where you have to spot what’s wrong in the scene. In the beach scene on the first page, you can find a shark in a paddling pool and a man watching TV in the bath. There are hours of fun for kids and adults, and when you’ve solved all the puzzles, you can go back and find the tui and the grumpy garden gnome on each page. I love Donovan’s illustrations and The Looky Book just shows how versatile he is. Not only does he give each human or animal it’s own personality, but he can make these a small part of a large scene. He makes every little detail count, and these little details are hilarious (sheep holding up a ‘Lamb Carter’ banner or a penguin wearing a tie). The reason I love Donovan’s illustrations is because they are always so colourful and they seem to glow. He seems to use this effect that makes certain objects or characters shine. Just look at the front cover and you’ll see what I mean (the eyes, the telescope and the kea’s beak). I would love to know how long it took Donovan to create each spread. There is an incredible amount to see on each page, and some things you won’t see the first time. Donovan his given the book a real Kiwi feel too, with lots of local wildlife and some Kiwi icons like Hokey Pokey ice cream. If you have a very keen eye you might even spot a reference to one of Margaret Mahy’s stories on the first page. Christmas is only weeks away and The Looky Book will make a perfect present for kids young and old.